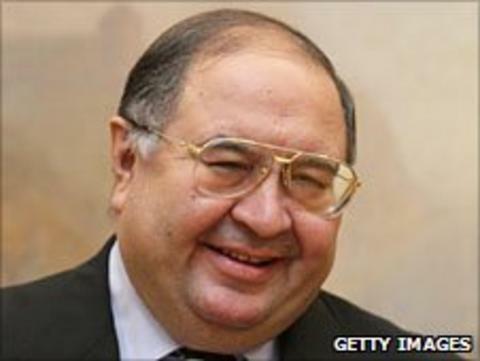 Uzbek billionaire Alisher Usmanov has increased his shareholding in Arsenal to over 29%. The move follows his pledge not to sell his shares after majority shareholder Stan Kroenke triggered a mandatory buyout offer in April. Usmanov's Red and White Holding company said in a statement: "Red & White today announces that it now holds a stake of over 29% in Arsenal Holdings plc." American businessman Kroenke's holding in Arsenal currently stands at 66.1%. Kroenke made an initial takeover move for Arsenal in April when he bought the stakes of Danny Fiszman (16.1%) and Lady Nina Bracewell-Smith (15.9%) for a fee of about £234m. The Premier League approved the takeover last month, prompting Kroenke to give the club's remaining shareholders 14 days' notice on his offer to own 100%. However, Usmanov insisted he would not sell to the American, as have the Arsenal Supporters' Trust, which owns some of the remaining shares. Usmanov bought into Arsenal in August 2007, when he paid former vice-chairman David Dein about £75m for his 14.65% stake.